Angle grinders are already one of the more versatile tools you can find in the kit of any well-equipped contractor, at-home DIY enthusiast, or handy person. When you add a cordless capability to this tool, you take its usefulness to whole new levels. Now, you have a tool with outstanding versatility coupled with the go-anywhere, do-anything nature of the best cordless angle grinder. Such a combination has, of course, helped to make this tool one of the more popular types on the power tool market these days. There is a range of manufacturers all vying to bring the top cordless angle grinder. Each model boasts a range of useful features, but some are better suited for certain tasks than others. That being said, in this guide, we’ve identified five of the bestselling cordless angle grinder tools on the market today, and we’ll help you find the right one to suit your needs. 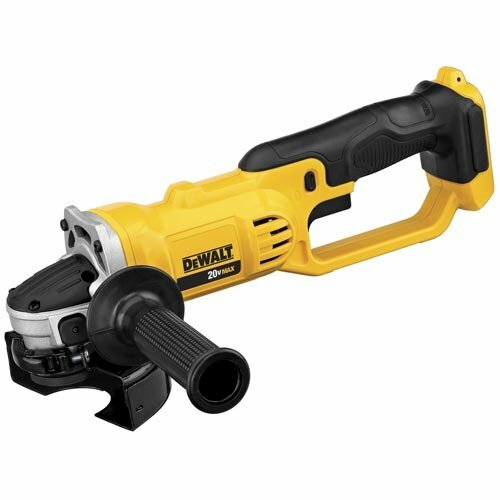 Our first product comes from DeWALT, a well-known company with a reputation for producing top-quality power tools. This model is of a slightly unusual design, boasting an ergonomic grip with a built-in trigger guard. Its appearance is certainly eye catching, but is there more to this model that may help make it the best battery-operated angle grinder for you? When you see the black and yellow design of DeWALT, then you know you are picking up a quality power tool. That’s true here since this is a model that comes packed with useful features. First off, it has been designed with comfort in mind. To that end, the front handle can be moved into two positions to find a grip you find comfortable. The rear grip is also ergonomically designed and includes a cool trigger-guard style design. In use, the tool has a quick-release button so that you can change discs or attachments safely and quickly. The 20-volt motor sounds powerful, but the tool can, in reality, only deliver a max of 8,000 RPM speed. That’s quite a bit below the 11,000 RPM that you would expect to find on a premium model. There is also no variable speed option, so when you press the trigger, the tool fires up to maximum revolutions instantly and stays there. All in all, this is a well-built tool with the solid construction you expect from DeWALT. It’s just a little let down that it is not quite reaching the premium performance of the other high-quality brands. While most cordless angle grinders are sold as a tool only, VonHaus have gone against the grain by presenting a complete kit. With a purchase, you'll have a solid angle grinder tool, a battery, a charger, a carry bag, and even a free cutting disc; everything you just might need to get started all delivered in one convenient box! 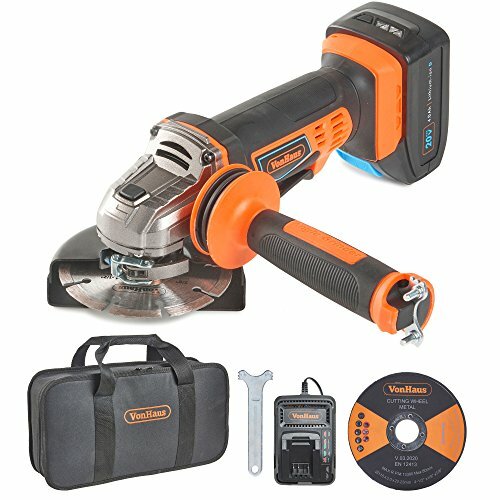 What you have here is an excellent angle grinder start kit that delivers phenomenal value for money. So, while many toolmakers will only sell you the angle grinder tool, here you get a full kit for a similar price others charge just for a tool. On top of that, it’s a decent and somewhat basic model, which means that the motor inside is nice and powerful with a 20 Volts max output that translates into 11,000 RPM. That is going to be enough to tackle a range of tasks. The handle is designed to dampen vibration and can be mounted on either side of the tool, making it comfortable for left and right-handed users. As a more basic model, it is missing some of the bells and whistles found on higher-end models. The lack of a quick-release, in particular, is a big omission, meaning you have to fiddle with a wrench to get the discs on and off. Nonetheless, the safety of the user has not been compromised as it is equipped with a two-stage safety trigger. PREMIUM HIGH SPEC MOTOR - Runs at 11000 RPM. 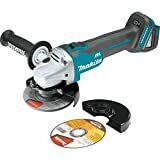 no load speed to deliver impressive abrasive force - includes Cutting Disc, 1x 4 ½" and Diamond Tipped Disc with storage bag. CORDLESS PORTABILITY - Portable with no restrictive power cords - suitable for use indoors and out. Comes with a 20V Max 4Ah battery which is compatible with all tools in the VonHaus 20V Max Lithium-ion D Series. AUXILIARY HANDLE - Reduces vibration and offers greater balance, control and comfort. Easy to remove and attach to either side. The handle also features storage for the included wrench to help with changing wheels. STRONG & LIGHTWEIGHT - Cast aluminium gear head designed to be strong, lightweight and durable. Makita is another manufacturer with a well-earned reputation for producing high-end power tools. This model is from the pricier end of the options, but it is also packing a range of premium features. The stand out feature for us has to be the motor. It is of a high-quality brushless design that means it has a frictionless operation, making it both long-lasting and extremely powerful. It also means that more power can be squeezed out of a smaller motor, so this tool, despite its power, is very small, weighing in at barely six pounds. The power of the motor is also very intelligently controlled, as the tool will hold back full power until the cutting edge meets resistance. This helps prolong battery and motor life while ensuring that power is always delivered exactly each time you need it. The only real downsides are that it neither comes with a battery nor a storage case. They are not deal breakers at all, but frankly, we were struggling to find the downsides to this very well-designed model. 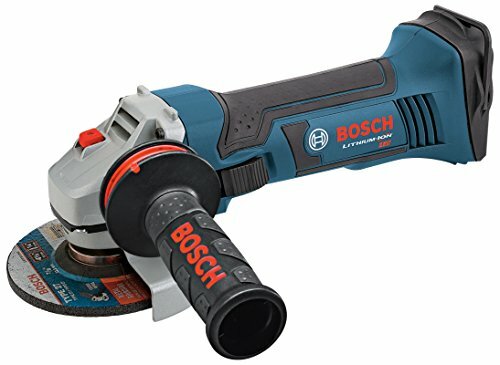 Our next product comes from Bosch, a manufacturer with a deserved reputation for producing extremely well-built power tools. This tool contains a number of the features that we look for in high-end angle grinders, so could this be the best one for you? This is a very good power tool, exactly what you would expect from Bosch. It is packing a number of useful features such as a quick-release button for fast and easy disc changes. It also has a comfortable ergonomic design, and the side mounted handle is designed to dampen vibration to make the tool easier to control. So far so good, but when you dig into the specs of the motor, it becomes a little less impressive. This model packs an 18-volt max output motor, which can only generate 10,000 RPM of spin speed. You’ll notice that both those numbers are a little below the power level generated by other premium-grade angle grinders. Bosch has probably done this to keep the weight and size down, and they have succeeded, as the tool only weighs about four pounds. So, it is light and small, but it’s also a little underpowered. LONGEVITY: The Bosch GWS18V-45 18V Angle Grinder delivers all-day grinding and cutting power. It's designed for a longer tool life with Bosch's Electronic Cell Protection and Electronic Motor Protection. POWER: The grinder includes a powerful four-brush motor design with 0-10,000 no-load rpm to handle the toughest cutting and grinding jobs. CONTROL: The tool features a two-position Vibration Control side handle, for comfortable control, less user fatigue and smoother grinding. SECURE: For user protection, this cordless grinder was engineered with a tool-less quick-change, burst-resistant wheel guard and restart protection to avoid accidental startup. PRECISION: The Bosch GWS18V-45 18V Angle Grinder provides outstanding cutting ability and is optimized for metal applications. 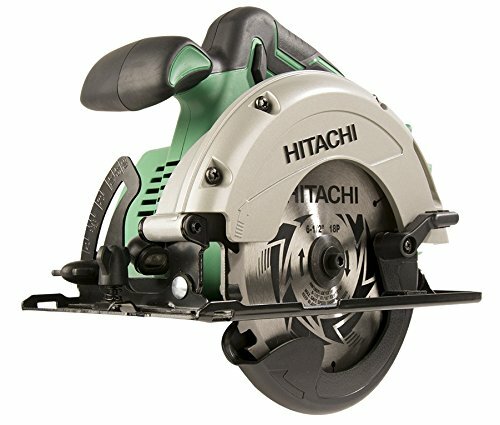 We finish up with this model from Hitachi, which is small both in terms of product size but also in terms of cost. As the budget tool on the list, is it still able to deliver enough features to be a useful power tool while also keeping a few extra bucks in your pocket? As stated, this is a budget model and so it is lacking in a few features you would expect to find on higher end products. For example, there is no quick-release button, so a wrench must be used to change discs. This can be fiddly and time-consuming, especially when you are in the middle of a job. The side mounted handle is also very basic, as it has no vibration dampening abilities at all. That being said, this tool does deliver decent power, with an 18 Volt motor that although being less powerful than some other models, it is still able to kick out a decent level of power. It’s also very small, weighing in at four pounds and only being about 12 inches in length. That makes it particularly well suited for use in smaller, closed-in working environments. Additionally, this unit is loaded with safety features like an overcurrent protection system as well as a zero-voltage reset capability that will prevent unintentional starts once the battery is loaded. Considering we had to really stretch to find any downsides at all, the winner has to be the Makita XAG03Z. 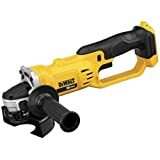 This tool takes the crown as the best cordless angle grinder mainly for the high-quality brushless motor. When combined with the built-in speed and torque controls along with the ergonomic design, you have a tool that is a pleasure to use and is guaranteed to deliver cutting power exactly when and where you need it.